There are always those dishes that are just perfect for a summer meal. They’re the ones that have the in-season produce and the bright and fresh flavors that just pop in your mouth. 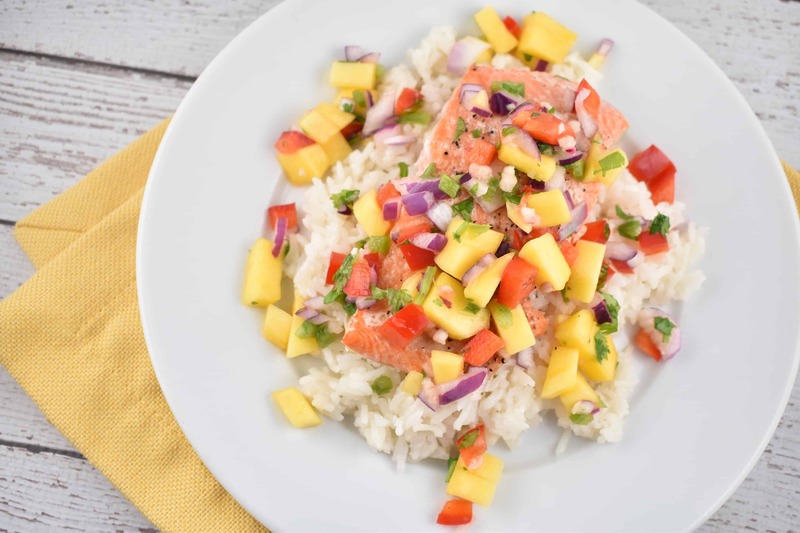 This Roasted Lime Salmon with Mango Salsa is the ultimate summer dish. It’s got fresh, irresistible flavors that come together perfectly to complement each other and make you savor each bite. The smoky salmon with the sweet and tangy salsa is just amazing. Salmon is one of the foods that you’re encouraged to eat now. It’s a healthy fat that’s high in omega fatty acids. The omega fats are ones that are used in brain and heart health and can also help to improve your HDL cholesterol (the good one) and give you a better ratio of HDL to LDL cholesterol. And the salmon isn’t just good for adults either, the fats found in it are essential in the brain development of children as well – so it’s a good choice for the whole family! This salmon is marinated in olive oil, lime juice and zest and garlic before roasting. The short, 30-minute, marinating time is the perfect amount to infuse the tender salmon meat with the lime and garlic flavors without overwhelming the flavor. It helps to lock in the delicious flavor. To improve the flavor of both the salmon and the marinade, be sure to salt the salmon before adding the marinade. Next up is the incredible fresh mango salsa. It’s delicious – take my word for it. You’ll need my fabulous Mango Salsa recipe, but you’ll have to control yourself. You need about 1 cup of the salsa for this Roasted Lime Salmon, so don’t eat it all before you get the salmon made! Everything in this salsa is in season right now, so it’s the perfect time to get everything at peak ripeness and flavor. The juicy sweet mango combines perfectly with the spicy jalapeno and garlic and is smoothed out by a bit of red onion, bell pepper and the lime juice. It’s bright and fresh and you’ll love every bite. And don’t worry, once you get the salmon made, you can chow down on the rest of the salsa! When I want an indulgence, I like to serve this salmon with a sweet, coconut rice, but you can also use cauliflower rice or roasted veggies if you’d prefer to keep the calorie count on the lower side. Since it’s summer, it’s the perfect time to break out the grill and grill up some delicious veggies! Grilling vegetables is my absolute favorite way to eat them. The flavor that the grill imparts is absolutely delicious. And while you’re at it, you can grill the salmon too. However, if you’re like me, and are usually too lazy to grill, this salmon is just delicious roasted too. Try these other delicious summer recipes! Sweet, tangy, and smoky, this summer dinner dish has it all! The fresh flavors work together to leave your palate feeling thoroughly satisfied. In a large, shallow bowl, combine the olive oil, lime juice, lime zest, garlic. Add salmon, making sure to coat well with the marinade. Cover and let marinate for about 30 minutes. Place salmon on baking sheet and roast in oven for about 10-12 minutes, or until salmon is cooked through. Top each fillet with 1/4 cup of mango salsa just before servings.